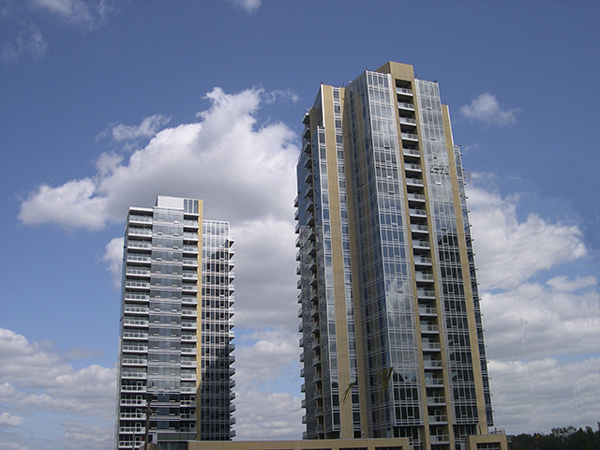 The Meriwether is the first residential building to open in the South Waterfront District. Meriwether consists of two high-rise condominium towers and seventeen street-level town homes. The Meriwether is LEED certified Gold, features upscale finishes, a concierge desk, secured entry, private courtyard and access to the new Willamette Riverfront walkway. There are 6 listings found for The Meriwether. Spectacular 15th floor Meriwether condo with jaw-dropping views of Mt. Hood, Mt. Saint Helens, Willamette River and PDX city skyline! Penthouse-style kitchen with large island, SS appliances, custom cabs, hardwood floors. Den could be non-conforming 2nd bedroom. Large covered patio and central location near OHSU, streetcar, food carts, restaurants, dog park and seasonal Farmers' Market. 1 deeded parking space. No rental cap. Pristine 2 bed, 2 bath on the 9th floor! Rare NW corner unit w/tons of windows & natural light pouring in. Relax & enjoy the serene river, mountain & city views. Entirely upgraded w gourmet kitchen w/lg custom island & high-end appliances, solid cherry wood floors, carrera marble bath, etched glass bedrm doors, B-I desk/murphy bed, new carpet, fresh paint & expansive deck. South Waterfront offers walking trails, street car, tram & OHSU. Designed by interior designer, Jeff Lamb, and featured in Portrait of Portland magazine, this penthouse will not disappoint! Entertain in this open floor plan with sweeping views of downtown, mountains, the river and west hills. Three bedrooms + flexible den/family room. Rich Sapele woodwork throughout, rare Brazilian granite and custom built-ins provide beauty and sensible storage. Four deeded parking spots is a rare find!